The Duct Tape Engineer is helping to develop the next generation of innovators through engaging engineering projects. Q: Tell me about yourself and what you do. "Maker, educator, writer. My mission is to inspire the next generation of innovators and changemakers with fun and challenging STEM projects. To that end, I first created a library of free engineering project ideas. This lead to being hired at Galileo learning, an innovative K-8 summer camp company, where I manage their science curriculum. Imagine learning about physics by building a catapult - it's like that. I also wrote Rubber Band Engineer and Duct Tape Engineer, and a 3rd book is on the way." Q: Do you incorporate duct tape into your projects? "Duct tape is in my list of top 10 things I'd carry with me if the zombie apocalypse should occur. It's indispensable. I've used it for creating a slingshot pouch, holding together a PVC crossbow, and even the backpack I bring to the office. T-Rex tape is my favorite." Q: What do you use to create your projects or what do you like to use? 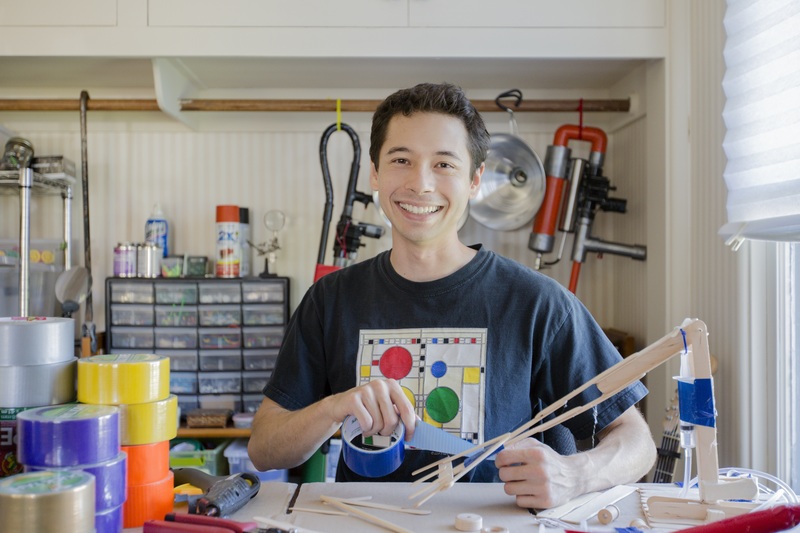 "Everything I build is made with household hardware: paper clips, rubber bands, craft sticks, hot glue, etc. If you already have it in your home, it's easier to get started and actually make something. It's also very cheap." "My inner child comes out to play a lot. If I see something that looks fun to me, it's probably fun for others. I frequently get started just by watching YouTube videos or Google Image searches." Q: How did you get in this field, and what advice would you give to an aspiring teacher? "I started teaching and developing curriculum because I asked an after school program if they'd let me, and they said yes. My first projects were rubbish, but I kept doing what I was doing, reflected on what did and didn't go well, and got better. If you're in the same boat as me, I suggest the same. For me, failing forward was the fastest way to develop my expertise and find my style." Q: What has been your favorite project you've ever done? "The rubber band helicopter. After many iterations, it had become the first project that I felt was truly original and lasting. I still build one from time to time." Q: What skills do you need to be an engineer? "Skills aren't as important as your mindset. Perseverance, curiosity, and a willingness to learn-by-doing are excellent teachers. Don't know how to use a glue gun? Jump in, try building something. When it falls apart, ask why? Try again." Q: How do you encourage creativity and imagination with your kids? "It's a balance of guidance and free-range making. For example, at Galileo, we might first show kids how to make a catapult that works to some degree. We then plant seeds of ideas on how they might improve it. This scaffolding allows kids to experience some success, which emboldens them to try new ideas to improve their creations."